Your marketing list is the core of running a successful marketing campaign. It can include any one type of customer record, such as leads, accounts, or contacts. Static Use a static list if you prefer to add and update members manually. 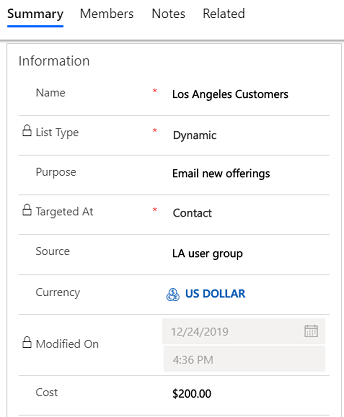 Dynamic Use a dynamic marketing list if you want the list to return a list of members dynamically when needed, based on search criteria you set. For example, if you want to run a campaign to members of a specific city, use a dynamic list. A dynamic marketing list retrieves the updated list of members each time you open the list, create a quick campaign from the list, or distribute a campaign activity for a campaign associated with the list. Go to Marketing > Marketing Lists. Add or change the information in the Summary area. This screenshot provides an example. To look up records in the Owner field, first click Save, or you'll lose your changes. Click Save so you can enter information in other areas of the form. Add any other information that applies to your marketing list in the Notes area. In any marketing list record, in the Members area, click the Add button. In the Manage Members dialog box, select one of the following options, and then click Continue. In the Look Up Records dialog box, select your search criteria. Select the records that you want to add, click Select, and then click Add. In the Add Members dialog box, click Select, and then select the field on which you want to search, such as Account Name or City. You can select fields from the current record type, or from related record types. When you select a related record type, a new line appears with another Select list for the related record type. Click Equals, and then select a query relational operator (for example Contains or Begins With). Click Enter Text, and then type the value that you want to locate. To specify the columns to include in the search results, click Edit Columns, and then Add Columns. Then select the columns that you want to add, and click OK. Select the members that you want to add, select one of the following, and then click Add to Marketing List. Click Enter Text, and then type the value you want to locate. To specify the columns to include in the search results, click Edit Columns, and then click Add Columns. Then select the columns that you want to add, and click OK. Select the members that you want to remove, select one of the following, and then click Remove from Marketing List. Select the members that you want to keep, select one of the following, and then click Update Marketing List. In any marketing list, on the command bar, select Manage Members. In the Manage Members dialog box, click Select, and then select the field on which you want to search, such as Account Name or City. You can select fields from the current record type, or from related record types. When you select a related record type, a new line appears with another Select list for the related record type. Click Equals, and then select a query relational operator. Click Enter Value, and then type the value that you want to locate (for example, "Seattle" or "Email"). For some values, you can click the Lookup icon to open the Select Values dialog box and select the value you want. To specify the columns to include in the search results, click Edit Columns, and then Add Columns. Select the columns that you want to add, and click OK.
Click Use Query to add the matching records to your dynamic marketing list. After you have created a campaign or quick campaign, you can associate it to your marketing list. You can also create a new campaign or quick campaign from your marketing list. In the Campaigns or Quick Campaigns area, click the Add button. Search for the campaign or quick campaign you want to associate to this marketing list. If you don't have any campaigns, or if you want to create a new one, you can click + New. If you don't have any quick campaigns, the Quick Campaign Wizard will start.